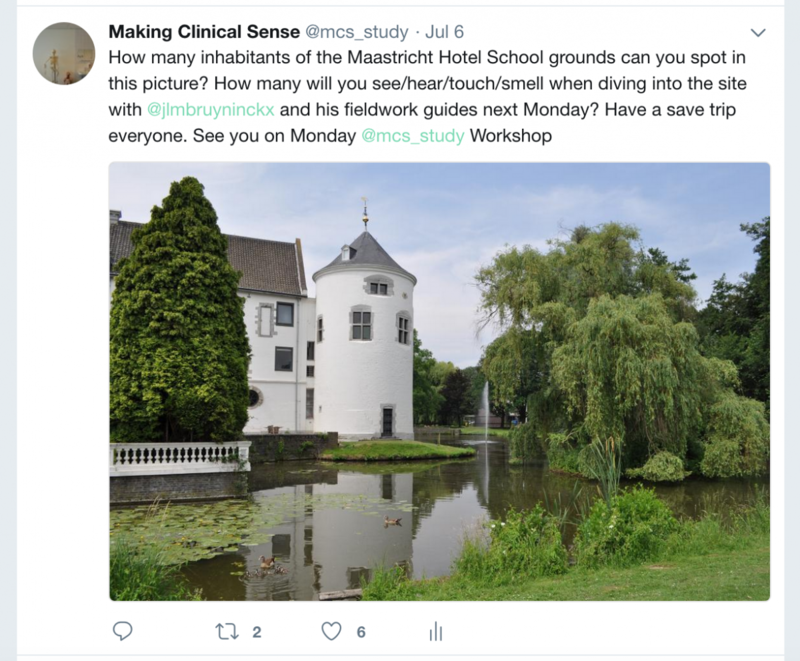 MAASTRICHT, July 9 – 12th 2018 – Written correspondence takes so many different material forms today, digital and non-digital, and it was precisely this variability in form that we wanted to play with in our first project workshop, July 9th-12th. How is a workshop conversation shaped not only by the verbal discussions that take place during the event, over lingering breakfasts, cooking classes, walking seminars and four-course dinners, but also the written correspondences crafted around it? Workshopping, as the philosophers Ludger van Dijk and Erik Rietveld reminded us last week, is a situated event that extends temporally and materially. Our workshop invitations were sent early this year, on paper bought at a local newsagency, made at a Belgian paper mill. The RSVPs came back in the form of postcards, each with a different instructional teaching poster printed on one side. In the lead-up to our workshop last week, over the last weeks and months, we continued the conversation by Skype, FaceTime, telephone, twitter and many many emails. At the workshop itself, participants received a pack with writing paper and a pre-stamped postcard. There was a letterbox for sending mail out. Each of these forms of correspondence intersected and created not only different spaces for communication but also shaped the communication we had. Conversations co-existed in different temporal realms – an invitation in the post punctuated by emails, a postcard sent out after the WhatsApp message arrived. If we attend to the medium as message, the materiality of our correspondences takes on heightened importance. A love letter sent by pneumatic tube is different from an email written at a office desk, different from a tweet thumbed at the airport, or a postcard written in the sun. When I was a high school student, there was a university mathematics professor who sent problems to some students around the city where I lived in the mail, photocopied equations which we were to fill out and send back to him. They would soon be returned to us marked up in red pen. We learned maths by correspondence, the teaching and learning a back and forth sent in the mail. 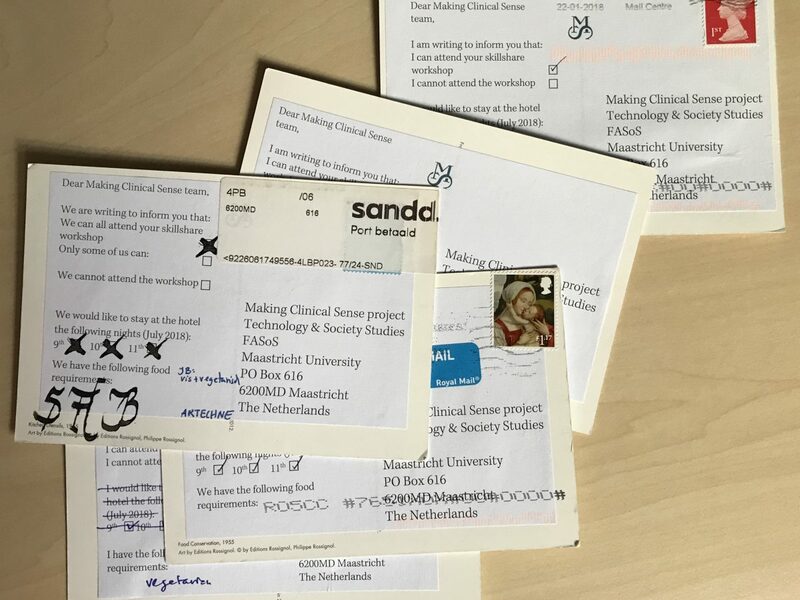 Members of the Making Clinical Sense team used the postal system to correspond about our developing ideas too. 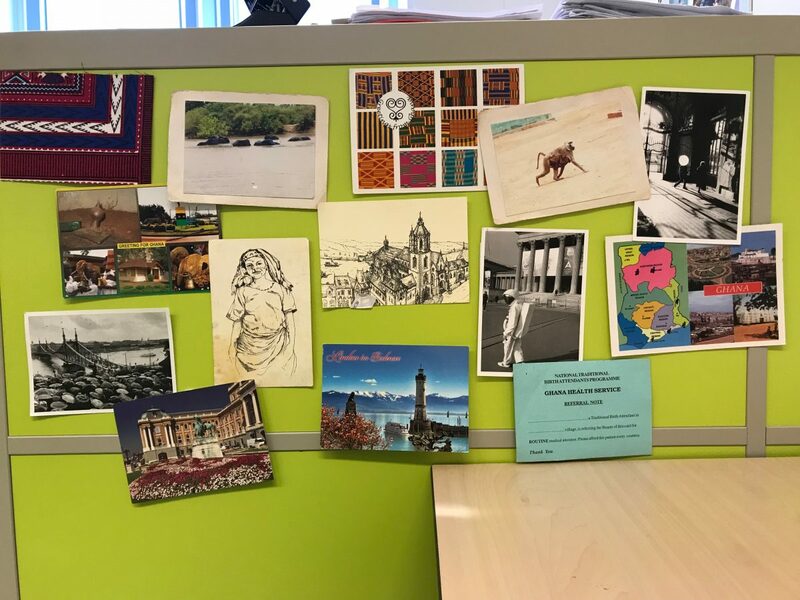 Seven of us in a combination of different cities for most of the last academic year, we sent each other postcards often, most arriving, some getting lost in transit, or stuck to other cards, arriving at destinations unthought of. 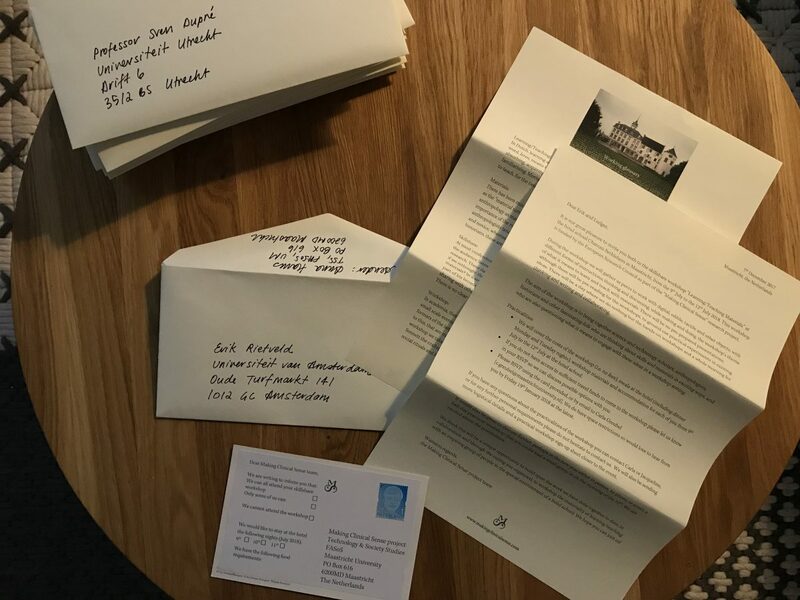 We will be writing more about these postcards on this logbook and these cards will be displayed at the upcoming European Anthropology EASA 2018 conference in Stockholm as part of a project exploring the role of postcards in ethnographic research. We ourselves still have to explore what it means to workshop, learn, teach, research and collaborate through different forms of correspondence; what different material forms allow space for; what it might to take seriously the message as medium; how written threads take meandering paths, intersecting and branching off as they connect and go off in their own directions.